Angela sits on the floor, surrounded by a wriggling mass of Dalmatian puppies. They all look beautiful and her heart sinks as she contemplates trying to select one. How was she ever going to pick a dog that might be a potential show winner? While visiting her friend overseas, Angela was taken along to a few dog shows and developed a real interest in activity, deciding that she would like to get involved too. On returning home, she immediately began researching breeders in her area for her favourite breed, the Dalmatian. She was delighted to find that 3 breeders in the area had just had litters and were looking for homes for their puppies, so she hurried to visit them all. But very quickly, she became disheartened. With the help of her friend overseas, Angela located a man living in her area who had been showing Dalmatians for years and was delighted to find that George was friendly and helpful. Like many breed enthusiasts, he was keen to help others starting out in the hobby and readily agreed to go with her to view the litters again, although he advised Angela to wait until the puppies were a few days before their 8 week birthday as by this time, puppies of most breeds would give a good indication of how they would develop as an adult, in terms of proportions and shapes. You save yourself a lot of heartache if you buy from a breeder who has done all the necessary health screening tests and who only breeds from animals with good temperaments. Also, they will do all the necessary early socialisation to help your puppy grow up into a confident, well-balanced dog – which is something that’s very important for any dog and definitely for a show dog, who will have to go into crowded, strange places and deal with lots of strangers. In addition, a reputable, experienced breeder is also more likely to know the breed standard well and therefore be producing puppies that were likely to match the ideal blueprint for the breed. They could also offer more advice and insight into their litter, so that they can help you find what you’re looking for. 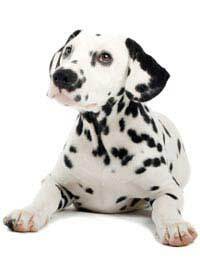 Angela examined a range on things on each puppy, from the markings – especially in a breed like the Dalmatian – as well as other things, such as checking that the puppy did not have an uneven bite or any disqualifying faults based on the breed standard. For Dalmatians, this would something like having a curly tail or spots that are both brown and black. Since Angela wanted a boy, she also had to check that her puppy had two normal, descended testicles, although sometimes they may drop later so she had to keep that in mind. Finally, George helped Angela asses the way each puppy moved, observing its natural movement form the front, side and the back. They were looking to avoid any puppies with a hocky look or with a funny gait. By this time, Angela found it quite easy to choose a puppy that she liked best and was soon heading home with her new canine companion.